One of the components of the grade 6 curriculum is having students understand the difference between the Mother Clan, Chief and Grand council, as a part of the Iroquois Confederacy. A teaching tool I decided to utilize was jig saw. Students in their table groups were to pair up and research one of these components. Once done they would then come together and share what they found with the rest of their table group. 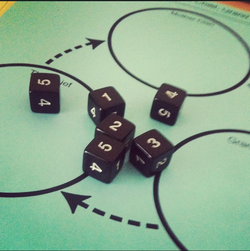 In order to determine what each pair had to research, students took turns rolling a dice as seen in the image to the left. Every number would correlate to a topic as depicted below. Students recorded their information on the graphic organizer as seen in the PDF file below. To further peak their interest I had the information projected on the smart board as well as on a Lap Top for their table group. They were given 15 minutes to gather the initial information and another 15 minutes to share that information with the individuals at their tables. As a class we then combined all the information on the smartboard allowing students to have a complete set of notes. We also discussed the similarities and differences between Ancient Athens and the Iroquois Confederacy.